1/4 scale 147.6″ (3750mm) span of a really lovely soarer of the pre-glass fibre ‘hotship’ era. 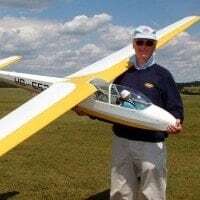 This glider plan was designed by the late Cliff Charlesworth whom over the years designed several sailplane plans for various remote control gliders. This product is available as a “plan” or “short kit”. 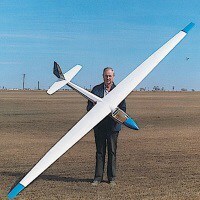 It is reasonably straight forward to build and very easy to fly. 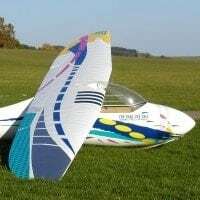 There are three variant canopies available for this model, all of which can be purchased from Sarik Hobbies who stock a vast range of plans, kits, wood kits and accessories for model aircraft. Designed for radio control up to 5 channels. Aileron, elevator, rudder, airbrakes and tow release. This glider was produced from 1947 by Elliotts of Newbury. 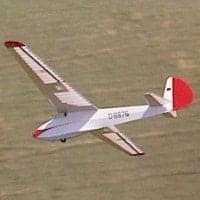 Elliotts had been asked in 1945 by Chilton Aircraft Ltd to make one set of wings for the Chilton Olympia, a glider that had been developed in pre-war Germany as the DFS Olympia Meise. This had been designed by Hans Jacobs and selected as the glider for the 1940 Summer Olympics. The German drawings were not detailed and so entirely new drawings were made by Chilton that merely retained the Meise Olympia’s aerodynamic shape. Otherwise it was a complete re-design and resulted in a stronger and heavier (+30 kg) aircraft. To maintain employment at their factory, Elliotts refused to sell the wing jigs that they had made for the prototype. Consequently, Chilton gave up all aircraft work, agreeing to sell to Elliotts the production rights, fuselage jigs, and work in hand on all Olympia gliders. Production of the Olympia (originally called Type 5) started in 1946 as a batch of 100, and the first flight was made in January 1947. Elliotts and their design consultants Aviation & Engineering Products Ltd made improvements to the original design before starting production. Marks 1, 2 and 3 were produced, mainly distinguishable by the landing gear. The Mark 1 had only a skid whereas the Olympia 2 had a built-in main wheel. The Eon Olympia 3’s wheel was jettisonable after take off. The first batch of 100 was completed in 1947 but the market could not absorb such a large number, despite the low price of £425. Even by 1953, 40 of the first 100 Olympias were still unsold. Nevertheless, a second batch of 50 was built. 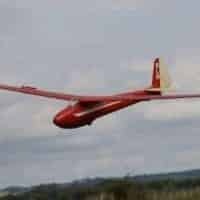 Gliders from the second batch were still being offered for sale for £800 as late as 1957 in order to clear the stock, despite being below cost price. After building three marks of the Olympia, another improved version, called the EoN Olympia 4 was produced in 1954. This is regarded as being sufficiently different from the original as being a new type. This type in turn led to a succession of variants.